Coolpad Communications, the Indian joint-venture of China Wireless Technologies Limited today announced the launch of cheapest touchscreen CDMA Mobile Phone S100 at Rs.4500. The handset will retailed through Reliance World stores in Mumbai and Maharashtra telecom circle. The low-priced Coolpad S100 touch screen CDMA Mobile Phone has shining display with great resolution, 1.3 mega pixel camera, Powerful battery backup and can be used as a CDMA 1x modem enabling instant Wireless Internet connectivity for a laptop or computer. The S100 is 14.9 mm thick and has a 2.4 inch TFT touch screen and sports a smooth display. It comes with 64MB NOR-Flash internal memory include powerful capacity for storing up to 1000 contacts, 500 SMS, 200 call logs. It also supports T-Flash/MicroSD card up to 2GB with a card extension slot. This cool touch phone operates on CDMA 800 MHz frequencies and is powered by a 900mAh Li-ion battery. The handset equipped with MP3/MP4 multimedia player, FM Radio and supports USB and PC Sync and features 64-bit polyphonic ring tone and lots of business applications include E-mail, incoming call firewall (great privacy security feature) and file browsing. It supports WAP/OTA and has hands-free function. The WAP browser which enhances its Internet applications and provides best connectivity from anywhere anytime. For easy messaging it comes with Text input predictive software. Other functionalities include Alarm clock, world clock, calendar, calculator, memo, caller filter function, Email, photo album, photo editor, wallpaper and games. 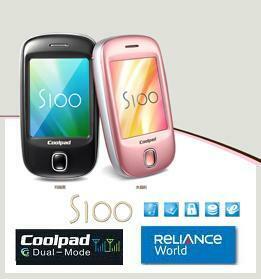 Coolpad S100 also offers anti-theft security system, advancement to the mobile tracker. It’s allowed to register up to 3 mobile numbers to receive the antitheft message. Once, if the wrong password is inserted three times a message goes to such 3 mobile numbers fed initially and with such antitheft message originally registered number can remotely control your mobile (such as power on, destroy user data and so on). It also allows provides a data backup facility that allows the user to save his call logs, messages, contacts and calendar in the memory card and any lost data can be recovered.